ANAHEIM, California — At NAMM 2015, HARMAN’s Crown announced it is now shipping its XLi Series, four models that set a new standard for entry-level professional grade amplifiers. The new XLi3500, XLi2500, XLi1500 and XLi800 are powerful, rugged and reliable and are well suited for a wide variety of live and installed sound applications. 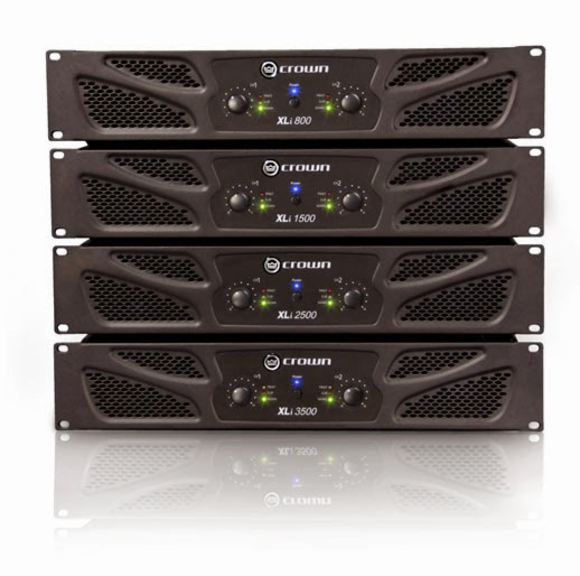 The Crown XLi3500, XLi2500, XLi1500 and XLi800 deliver 1,000, 500, 330 and 200 watts per channel respectively (into 8 ohms; 2,700, 1,500, 900 and 600 watts in bridged mode into 8 ohms). All models feature user-selectable input sensitivity to accommodate a variety of program sources that have low output signals and include balanced XLR and unbalanced RCA inputs. XLi can be operated in stereo, parallel or bridged-mono mode and provides binding post and speakON output connectors to facilitate use with virtually any type of passive PA speakers. All four amplifiers feature front panel level controls, signal presence, and clip and fault LED indicators. Like all Crown power amps, XLi Series models provide comprehensive protection against shorts, no-load conditions, and power on/off thumps. The amplifiers are also shielded against radio frequency interference to keep the sound quality pure, even in situations with a great deal of wireless activity. All Crown XLi amplifiers feature a one-year, no-fault, fully transferable warranty. Crown XLi Series amplifiers have MAP pricing as follows: XLi3500, $649; XLi2500, $399; XLi1500, $299; XLi800, $229.